On Monday 6 May, Galleria Marie-Laure Fleisch will inaugurate 21 Quadrati, a personal exhibition of the artist Sergio Breviario who returns after two years to exhibit once more in Rome in the Vicolo Sforza Cesarini space. Breviario continues his personal research into the construction of measurable worlds; studied and stable spaces inhabited by new forms generated by the harmonious juxtaposition of diverse elements. As his previous installations, Brevario reinterprets the exhibition space, constructing his own personal seeing-machine which, in this case perceives abstract bodies formed when the elemental form of the square is decomposed and de-structured. The central element of the installation is a table on which we see mysterious arrangements of paper; twenty one structures constructed from identical squares from which triangles have been removed to then be glued onto what remains of the original square. The process is based on mathematical formulae chosen by the artist and gives rise to new forms and shapes with different numbers of vertices. It is almost as if Brevario feels obliged to apply a numerical approach when creating his works. Mathematical studies of plants has demonstrated that the order of botanical elements such as leaves, flowers, fruits is predetermined; indeed the geometrical structure of the organism is governed by underlying laws attributable to the science of numbers. 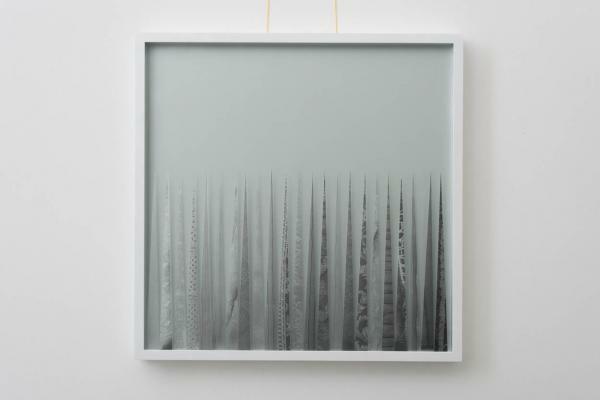 The same process occurs in Sergio Breviario's work. 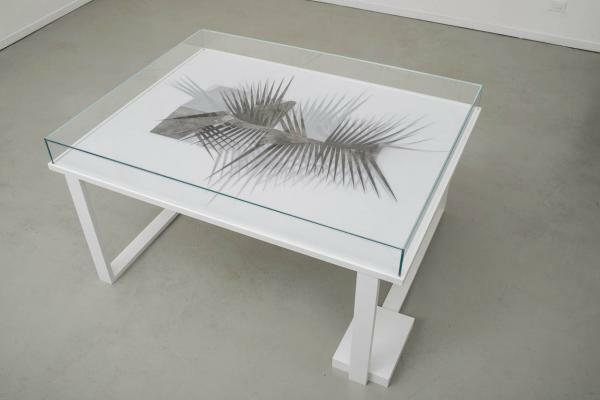 By applying simple and definitive mathematical schemes to a pre-existing elemental form, he creates new complex forms which are the mere expression of themselves. 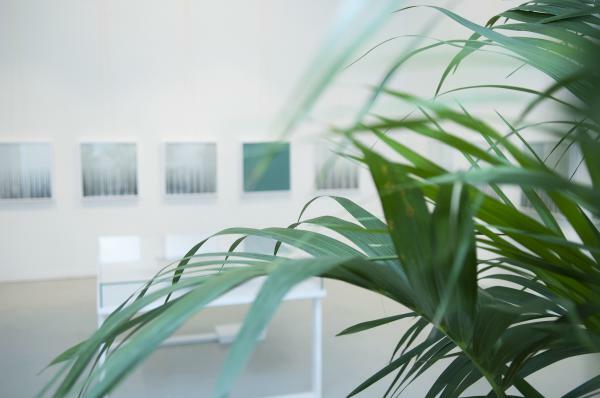 Indeed, they take on the appearance of plants with their geometrical-mathematical construction; extremely light paripennate leaves laid out in layers on a flat surface. They can be seen, semi-hidden between gossamers of synthetic polyester; their contours softened and rendered opaque and vibrant by the application of a grey tint foreign to the living organism and more akin to its artificial reproduction. 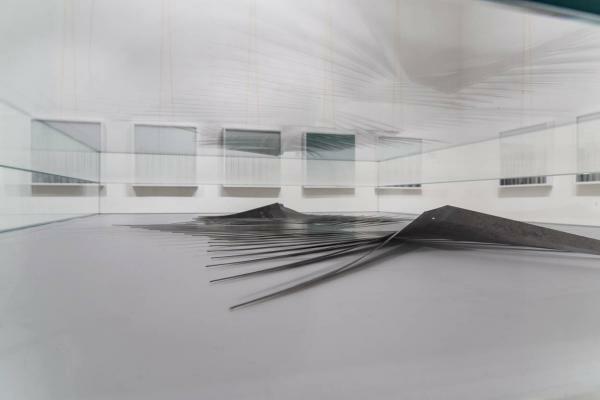 The gallery walls are covered with collages, each one composed of twenty three triangles glued onto various layers of glass; a technique which creates depth and a certain shadow-like effect. Taking on the appearance of fields of paper, the only foreign element is the texture of these angular cuts of brocades and other precious fabrics, confirming Brevario penchant for using uncommon, outdated materials and forms. These are photostatic images which, with their two-dimensional form, reproduce classical decorative motifs. But underlying all of these effects are a series of precise numerical parameters: the triangles (or blades of grass) are all exactly 32 cm tall, whereas the white space above is exactly 23 cm and everything is framed in a 55 x 55 cm square (32 + 23 = 55). The numbers 32 and 23 are recurrent in Breviario's constructions; numerical palindromes establishing the parameters for his operative method of creating form. Once again, another pretext to try to render everything measurable, to give method to creation which, like nature, tends to distance itself from any significance: “I want that the work express itself just like a body expresses itself, and not as a means to tell the story of something else”(Sergio Breviario). Sergio Breviario (Bergamo, 1974. lives and works in Milan). Winner of Premio Lombardia in 2012, he also received a special mention in the Premio Moroso 2013. Among his solo exhibitions, we cite: Prototipo di macchina per la conquista del mondo (Centro arti visive Pescheria, Pesaro, 2012); Drawings by 2 (with Marco Bongiorni) (Galleria Marie-Laure Fleisch, Rome, 2011); L’erba del re non fa crescere i fiori (Fabio Tiboni arte contemporanea, Bologna 2010); P.E.P.E. (Galleria Piac, Ragusa 2007); and Diciannove novantasei: mi edifico e ti guardo (Viafarini, Milan 2006). Among his group shows, we cite: Arimortis (Museo del 900, Milan, 2013); Punti di Vista (Palazzo Arnone, Cosenza, 2012); Don't Come If You Care (Het Wilde Weten, Rotterdam, 2011); Difetto come indizio del desiderio (NEON Campobase, Bologna, 2011); A ruota libera (MAXXI Museo delle Arti del XXI secolo, Rome, 2011); Transition. A private matter (Roaming, Prague, Czech Republic, 2010); Non voltarti adesso/ Don’t look now! 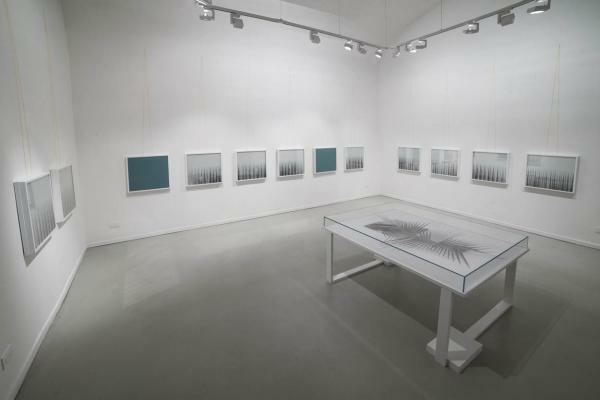 (Cà Pesaro, Venice, 2009); Repetita iuvant (Roaming Assab one, Milan, 2008); THIN LINE: THE EXHIBITION, THE MOVIE!! (VUB, Brussels, Belgium, 2005); Thin line 4 (Viafarini, Milan, 2005). Works by Sergio Breviario can be found in various public collections such as the AMACI (associazione dei musei d’arte contemporanea italiani) and the MART, Rovereto.